It is my great and distinct pleasure to introduce the Henry Hazlitt Lecturer, Peter Schiff. Schiff, president of Euro Pacific Capital, is familiar to everyone who has watched financial coverage in the last year. He is famed for being the most vocal financial economist to have perfectly predicted the crash. He also happens to be a dedicated student of the Austrian school. He is the author of the prophetic Crash Proof and, most recently, The Little Book of Bull Moves in Bear Markets. Whenever he speaks about finance and economics, he also seeks to teach sound economic theory, writing for publications such as the New York Times and the Washington Post. Today he will speak on the relationship between theory and practice in financial markets. Peter Schiff. I just looked at the topic for my speech about thirty seconds ago before I walked in the door. But apparently I'm talking about why is it that people didn't see this coming, or should people have known that this meltdown was coming. I don't know. Is there anyone in this room that was surprised by the economic meltdown? Does anybody think it's over? Anybody? Raise your hand if you think it's over. And does anybody think that the government solutions are going to work or that they're going to help? Is there anybody? One. All right. So, I guess there's really no reason for me to speak here. I don't know that I'm going to tell anybody anything they don't know. But, if you want to indulge me, I guess I could talk about it a little bit anyway. But I don't know why so few people seem to understand what was going to happen. I guess when you're living inside a bubble, it's very difficult to actually see what's going on, from your point. But I lived through two of them, because I'm a stockbroker. I lived through the NASDAQ bubble. And to me, at that point in time, it seemed pretty obvious what was going on, in 1997, '98, '99. It seemed obvious to me that these companies that people were touting couldn't possibly be worth the prices that people were paying. Yet nobody seemed to be able to figure that out back then. Everybody seemed to be living in this new era, and the Internet had captured everybody's imagination. To me, I couldn't see the difference between the Internet, really, and a catalog or a telephone. People were saying that everybody's going to buy everything on the Internet. Why? Why aren't people just shopping by telephone? Or why aren't they just buying everything in a Spiegel catalog? It didn't seem that it was any different. And I knew that the valuations they were putting on a lot of these companies, I knew they'd come out with a company, maybe it'd be Doorknobs.com, or whatever it was. And you'd say, "Well, gee, even if they sold every doorknob in the world, they couldn't possibly be worth the multiples that they're trading at." And of course they didn't even make any money selling them. And the whole idea behind so much of the e-commerce was just nonsense. The idea that it was more cost effective to individually FedEx items to people, as opposed to letting them show up and buy them and put them in their cars and leave. There's no way. There are certain items that lend themselves to online sales, but most items didn't, but it didn't matter. Everybody was going public. And people were getting rich, but none of the people were getting rich because the businesses were successful. The people were getting rich because suckers were buying their stock. The guy that started eToys lived in my apartment building in downtown Los Angeles. And I started my company, Euro Pacific Capital, about the same time he started his. He made a lot more money than I did, but he didn't make a profit. He never made a profit. But he made a lot of money because he found people to buy into his idea. And at one point, eToys was worth more than Toys "R" Us. I remember when I was trying to get clients, back when I was starting out at Euro Pacific Capital, and I was trying to get people to buy foreign stocks. And I remember one country I was active in was New Zealand, and I remember trying to convince people who owned shares of stocks, like Yahoo, why they should sell their Yahoo and buy a stock in New Zealand. I would point out that Yahoo was worth twice the entire country of New Zealand; every stock they had, all the real estate. I'd say, "What would you rather own, this entire country?" The dividend yield on the New Zealand stock market was over a billion dollars a year. That was the dividend yield. Yet Yahoo was trading for more than twice the value of that whole stock market. I said, "What would you rather own, this company that just got started a couple years ago, or this whole country? And you could take all the dividends." No. No one cared; they wanted Yahoo. But it was just all nonsense, but nobody saw it. Of course, after the Internet bubble burst, everybody was talking about how crazy it was. And the politicians were ready to throw people in jail and they vilified Wall Street. But it didn't last very long. The whole thing was, in a year or two, we just moved right from that stock-market bubble, almost seamlessly, into the real-estate bubble, and nobody could see that there was any similarities. There was one. Somebody recently put together another one of those Peter Schiff videos. There was one that somebody made, this "Peter Schiff Was Right" video that was on YouTube that I know about a million three hundred thousand people have seen. "In a year or two, we just moved right from that stock-market bubble, almost seamlessly, into the real-estate bubble, and nobody could see that there was any similarities." But someone else put together a CNBC version of that recently and I happened to watch it. And there was one particular clip he put on with me and Mark Haynes, and I'm talking to him about this impending collapse and the economy and the real-estate market. And Mark Haynes just says to me, he says, "Peter, bubbles are like a once in a lifetime occurrence, we just had one." He said, "Do you expect me to believe that we have another one within ten years?" And he was just incredulous that there could be another bubble so close to the stock-market bubble. But, of course, they were really interrelated. It was almost like the same bubble, because we never really had the fallout from the bursting of the NASDAQ bubble. We simply replaced one bubble with a bigger bubble, and we postponed the consequences of the unwinding of the imbalances until right now. And, of course, we're still trying to postpone it. But I think, at this point, the damage has been so great and the problems are now so huge that I don't think there's another economic rabbit they can pull out of their hat at this point. We're just going to have to face it now. And, basically, what happened is, why did we have a stock-market bubble? We had a stock-market bubble because the Federal Reserve was too easy; they were too loose in the 1990s. Interest rates were too low, we created too much money, and that fed the investments in the stock market. And we had a lot of malinvestments. Companies were created that never should have existed. They were created not because they could generate a profit, but because they could go public, because investors wanted these stocks. It didn't matter that they couldn't make money. So what did they do? They took land, labor, and capital; they took all the factors for production, and they combined them in ways that actually destroyed value. But it didn't matter, because these companies got financing. The Fed made the financing cheap, so they were able to flourish. They were able to flourish despite the fact that they were losing money. The saying used to be, they'd lose money on every sale but they'd make it up on volume. And, so, but as long as they could raise money. And when I was working at Euro Pacific Capital, I would see deals and people would send me prospectuses on new companies they wanted to fund. I remember one I got from a small Internet company that was, I don't remember. They were — I don't know if it was a browser or whatever they were, or a service where you go on the Internet, a provider. I don't even remember what they did. But it was a small start-up, and they had their prospectus and they were coming around looking to raise money. And they were trying to raise, I don't know, five or ten million dollars. They weren't public yet. But they were selling a little small piece of their company, so they were valuing their company at about fifty million dollars. Now, these guys were in their twenties. They probably started the company less than a year ago. I remember saying, "Well, how could you possibly think your business is worth fifty million dollars?" I said, "You have no assets, you've got no revenues, you've got no customers. It's like, you don't have anything. I could recreate your entire business from scratch myself for next to nothing. And yet you want me to pay you five million dollars to get five percent of this thing? Why would I do that?" And all they kept telling us, "Well, you don't understand, we're going to go public, and you're going to make a lot of money." And I said, "You think you're going to find people to pay even more than this in a public offer? How are you ever going to make any money?" But that was the concept. And he said, "Well, you know, you don't understand how the stock market works." I was like, "I understand how business works and I understand that you guys are not worth fifty million dollars because you started an Internet company last week." But this is how it was working for a while. It was crazy. But I got the same things. During the real-estate bubble, I remember, I was renting houses — and I'm still renting my house now in Connecticut — and I would go and I would go to houses for rent. And I remember one time I went and there was a house for rent. I looked at it and the realtor was there. And, apparently, the person who was renting it out was an investor who just bought the place. And I asked them what was the rent. I forget what it was. Maybe it was $4,000 a month, whatever it was for this place. And I knew, I said, "Well, what'd the guy pay for this? What'd he pay?" I said, "Well, how could he make any money renting it out to me? Isn't this going to lose money? Doesn't he have negative cash flow?" He said, "Well, yeah, he loses a couple thousand dollars a month." And I said to him, "But you recommended this as an investment?" He said, "Yeah." "But why would you recommend, as an investment property, a property that has a negative cash flow? Why would you have him buy it?" And he said, "Well, you don't understand, this property's going to appreciate. This property could double in the next couple years." And I said, "Why? Why would it double? You can't even cash flow it positive at the price it's at now. How's it going to go up in value?" And I said, "Real estate is a function of rents." And then the guy said to me — same thing — he said, "You don't understand real estate." He was telling me that rents don't matter to real estate. Just like when I was telling people to buy stocks, they were telling me dividends don't matter. I'm buying this stock because it's going to go up. Well, why should it go up? It doesn't even pay a dividend. Who would buy it? I did the same thing, when I rented my apartment. After I got divorced, I was renting an apartment in Stamford, and — beautiful apartment, right on the water. I had my boat there. Beautiful views of the Sound. Right on the corner. Great unit, beautiful building. I had a concierge. It had a pool; it had covered parking; it was a security building; it had racquetball courts, had a gym with a trainer on staff; a lot of amenities. Right next door, there were maybe 20-year-old townhomes for sale. And I went to one of the open houses just for kicks. And there was a unit on sale, whatever they wanted, five or six hundred thousand dollars for this unit, that was about the same square footage as what I was renting, but it had no view of the water; it was dark, it was old, there was no security; it had none of the amenities. Yet the property taxes and maintenance fees alone were like a thousand dollars a month. And by the time I would have paid the mortgage, if that's how I financed it, I would have been spending more money per month to live in one of these little places than this really nice apartment that I was renting, right next door. And I asked the realtor, I said, "Why would anybody buy this place? You can just rent right next door. There's more units available; I know, I just rented." And the lady said to me, "Well, but when you rent, when you move out, you're not going to have any equity." I said, "Well, what do you mean?" She says, "Well, when you buy this property, then it appreciates, and then you can sell it when you move out and you make money." And I said, "Well, why the hell should it appreciate? Didn't you understand? It's already overpriced; you can rent right next door. Why should it go up?" And she said, "Well, that's how real estate works." I said, "So, you mean the way real estate works is I have to sacrifice; I have to turn down the opportunity to live in a really nice place; I live in this dump for a while and because I did that, I make money. And somebody else is going to come to me a year or two from now and overpay by even more and say, 'I don't want to live in that nice place next door, I'd rather pay more to live here because this is going to appreciate'." And they totally forgot what real estate meant. Real estate's a place to live. But everybody thought it was going to go up, so they were all crazed. But, anyway, getting back to where I was before I went off on all these tangents. So we had the stock-market bubble because the Fed was too easy. And, eventually, Greenspan started to raise interest rates. You saw what he was doing. He talked about irrational exuberance back in 1996, and they took him to the woodshed because he said something negative, so he shut up going forward. But eventually he started raising interest rates and he burst the bubble. He burst the stock-market bubble. And, of course, when the stock-market bubble burst, a lot of the malinvestments were exposed. A lot of people that were working at these dot-coms. Well, they needed to find real jobs because they were wasting their time, because they were destroying wealth. They weren't creating anything of value. So we had a lot of companies that had got capital that shouldn't have got capital; a lot of people invested foolishly, they're going to lose their money. But we were going to go through a painful recession, certainly, as we digested and worked off those malinvestments and allowed capital to be reallocated to where it could be productively used, which meant labor, which meant their land, capital, whatever was involved in these businesses. And, of course, with all the wealth that was squandered, because, remember, as people invested in these new companies, the money was just spent, it was squandered; it wasn't put away productively. So people lost real money. So people were going to have to come to terms with the fact that they lost money; they were going to have to try to save and replace it. So there was going to be a big recession when George Bush came in. But rather than being honest and admitting that the Clinton era was a fantasy, was a boom, and now we had to live through the bust — and that would have been a perfect opportunity right away to repudiate what had happened under Clinton, and say, "Look, Clinton didn't give us a good economy, we had a bubble economy. And now the bubble has burst and we've got to clean up the Clinton mess and it's not going to be fun." But, instead of doing that, he was like, "Well, we need to stimulate the economy, we need to fight off this recession." Sounds familiar, right? So, he wanted an economic stimulus. And what was the economic stimulus that we got out of Bush? Deficit spending, cut taxes, increased government spending. And Alan Greenspan cooperated and slashed interest rates down to one percent. And, so, we had massive monetary and fiscal stimulus. Massive inflation. And what was the result? Well, we blew up another bubble, a bubble that was bigger than the one that just burst. And, of course, during that shallow recession that we had — and Bush was so proud of that, so proud of the fact that he kept a recession from being more substantial — we had record car sales. We had record auto sales. Well, where'd Americans get all the money for all these car sales and all these home sales? Well, they borrowed it all. We went into debt. We had a massive spending spree, the biggest spending spree in world history. We borrowed trillions. What'd we do with the money? Spent it. We built houses, we remodeled our houses. We bought cars, appliances, furniture, gadgets, iPods and cell phones, and plasma TVs; all sorts of things. We didn't make any of the stuff, we just borrowed the money to buy it. "We went into debt. We had a massive spending spree, the biggest spending spree in world history. We borrowed trillions." And our trade deficits just skyrocketed. We started running 60 billion-dollar-a-month trade deficits for years. And our savings rate went negative. And it went negative even after the government doctored the books and recalculated how we calculate savings. If they were calculating the savings rate the way they did 10 or 15 years ago, it would have been minus, maybe, five or six percent. But they changed it and they decided to count certain things as savings that in the past they didn't count, because they wanted to make the savings rate look higher. Although, at some point, no one even cared whether we saved any money or not. No one thought that we hadn't saved any money. So we had this huge bubble that was much bigger than the stock-market bubble, and, of course, the major difference — and something that I pointed out repeatedly — was the leverage, the leverage involved. When people bought stocks they pretty much bought it with their own money. And if they got a margin account, maybe they had to put 50 percent down. And many of the brokerage firms were requiring higher margins on Internet stocks. So, when the bubble burst, the losses were pretty much confined to the people that made the bad bets. And at least when the losses happened, nobody tried to bail anybody out. If you lost money, you lost money. There was no one looking to the government to get their money back because they bought a dot-com stock that went to zero. None of the brokerage firms failed. Nobody failed because they had loaned money to people to buy stocks. This time around, of course, everybody who bought real estate did it with somebody else's money. Very few people were paying 100 percent. Many people were buying real estate with none of their own money; people were buying real estate with nothing down. Is it any surprise that people gambled when they had nothing to lose? And especially when they had so much to gain. Real-estate prices were rising. At one point, in California they took a survey — I think back in 2005 — and the average home buyer believed that his house was going to appreciate by 20 percent a year for the next ten years. That was what was expected. "Is it any surprise that people gambled when they had nothing to lose?" Now, you think about it. At the time, the average California home was selling for about $500,000, which was about ten times what the average household actually earned. So, but these guys actually believed that if they bought that house they would make $3 million over the next ten years. That's what they believed. Now, is it any wonder that they lied on their mortgage to get that $3 million? Is it any wonder that they signed up for a teaser rate? Do you think they cared what happened to the loan two or three or five years from now? They didn't care what the resale was — they were going to be rich. All they had to do was buy the house and they were going to be rich. It didn't matter what the mortgage payment was going to be, because the house would take care of it. In fact, if you figure what the average Californian expected to earn on house appreciation, it exceeded what he expected to earn from his job. So, it used to be that you'd work hard and have a job so you could afford a house, but it became the fact that, well, if you have a house, you don't need a job. And, in fact, in the past, if you lost your job, you might have to sell your house. No, not like in California. If you lost your job, you just bought a vacation house, because you got the extra income. Houses were not expenses, they were free. Because if you had a $500,000 house, it's appreciating, one hundred, $200,000 a year. And for a few years it worked. The people that bought houses were getting rich and the banks made it very easy to monetize that gain. You didn't even have to sell your house to make the money, because you could borrow out all the appreciation and still live there. So it's like the goose that kept laying golden eggs. Nobody would sell one of these things. Why would anybody want to sell a house? They just kept going up. And you could buy another house, with nothing. So, nobody wanted to sell, everybody wanted to buy. Of course I knew at the time that this was all going to change. I was renting and I was watching all the nonsense. I rented a house in California. I rented this place, and I first moved in, I think they were selling for about a million, a million-one, these are little townhomes, and I rented it for about forty-two hundred or forty-seven hundred. And at the time I rented it I was like, well, it's a no brainer. The rent compared to the property taxes, the homeowners fees, I knew. But I lived in that house for almost two years, and when I moved out they were selling for over two million a piece. So, obviously, I could have made a lot of money had I bought and sold, had I flipped one of those things. But when I moved out, the new guy that rented my house, I think he had to pay an extra $200 more than I paid. So, obviously, the prices had absolutely nothing to do with the rents. In fact, the place I rent now, people still always ask me, why are you throwing your money away on rent? I'm like, well, I'm not throwing my money away, I need to live. They don't ask me why I'm throwing my money away on food or throwing my money away on whatever else I'm buying. But that was the realtors: if you're renting, you're throwing your money away. As if buying a house you get to live for free. I'd say, "Why are you throwing your money away on mortgage, on insurance, on maintenance, on taxes?" I'm not worried about any of that. I live in a huge house now and I just pay first and last and the security deposit, that was it. But I know that the rent that I'm paying, after my landlord pays their property taxes, they're getting less than a one percent return on what they paid for the property, assuming nothing goes wrong. Because if anything breaks, they got to fix it, which is going to destroy their one percent. So, basically, I get all the enjoyment of the property and none of the headaches, and my landlord gets all the headaches and none of the enjoyment. So, what's the good deal there? But the realtors, the realtors were able to redefine the American dream. The American dream was always, You save your money, you work hard, and anybody can succeed. You don't have to be born to a royal family. You don't have to be an aristocrat. Anybody of modest means can grow up to be a captain of industry, can be president of the United States; that was the American dream. Somehow the realtors turned it into homeownership and buying a home and just getting rich; that was the American dream, that you didn't have to work. Well, that dream is now dying. "The realtors were able to redefine the American dream." And if you want to see a very good presentation, because I don't want to spend too much time on it, but if you go on YouTube, I made a presentation in front of the Western Regional Mortgage Bankers. I spoke at their annual conference two years in a row, 2005 and 2006. Now they stopped inviting me, so, I don't know, maybe they don't have a conference any more. I don't know if they have enough members left. But I spoke in 2005, and I said a lot of things were going to happen, and they brought me back in '06 because a lot of things did happen. But the 2006 presentation is on YouTube and it's eight clips. And it's a lot of really good stuff on the real-estate market. So — and it's a lot better to watch what I said back then, because none of it happened yet. So talking about it now, I don't look as smart. But, anyway. So we had this gigantic bubble. And the bigger problem here was the lenders. And I knew that when the real-estate bubble burst, that was going to be the end of it. Because I knew that the banks and the financial institutions had, as the bedrock of their assets, all these IOUs, all these mortgages. Well, if the mortgage holders don't pay, then the assets aren't worth what everybody thinks they are, which means the banks are undercapitalized. And I knew, just by looking at it, that Fannie and Freddie were going to have to go bankrupt. I knew they guaranteed 50 percent of the mortgages, and I knew that those mortgages were not worth anywhere near what Fannie and Freddie thinks. I knew what people were borrowing to buy these houses, so I knew that ultimately, when people didn't pay, the companies would have to go under. And I knew about the securitization process. I knew because, at the time, I was helping a guy set up a hedge fund in 2005 that was shorting subprime mortgages. And I learned about the whole securitization industry. And I knew that there are a lot of people that owned these structured products, which was one of the main reasons that there was a market for them. The reason that it was so easy for people to borrow all this money to buy houses was because of securitization. At first it started with Freddie and Fannie. If it wasn't for Fannie Mae and Freddie Mac, Americans couldn't have borrowed all this money to buy houses. The only reason they did it was because the US government was co-signing their mortgages. And people knew, well, if you lend somebody money to buy a house and if they can't pay you back, the government will pay you back. And, so, people were able to borrow a lot more money than a free market would have allowed because the government was there co-signing it. But there were some mortgages that the government wouldn't co-sign; these were the ones known as the subprime mortgages. But Wall Street figured out that, well, we can securitize these mortgages; the government won't guarantee them, but we're going to buy them all up and put them into these structured products, and by structuring them like this we're going to reduce the risk. And it was crazy, but something like, after they sliced and diced them, better than two-thirds of these subprime mortgages — and these are mortgages where people put nothing down — have lousy FICO scores, don't have jobs, are in prison, whatever it was. These mortgages, two-thirds of them were rated Triple A. Triple A. How can that be? I said, "How can you take all these lousy mortgages and they're rated Triple A?" Well, but it was because Wall Street was able to securitize all these bonds and sell them to the Japanese and sell them to the Chinese and sell them to the hedge funds that there was demand. And, of course, why was there so much demand for high-yielding assets? Because the Fed had the interest rate too low. Everybody needed yield and they were willing to take risk to get it. And where did all these foreign central banks get all this money that they recycled back into these bonds? Because of our trade deficits, because rates were too low. So you had the government perpetuating this crisis and you had the attitude that real-estate prices couldn't fall. I remember I had a booth, I had a booth in Phoenix, Arizona, at an investment conference. This is probably back in 2004, 2005. There was a guy right in a booth next to me, and he had a real-estate company. And what this guy did was he put people together who had lousy credit and who couldn't buy homes with people who had good credit. And the people with good credit co-signed the loans for the people with lousy credit. And, therefore, now this guy with bad credit can get a house, and the other guy got some extra payments or whatever it was. But there was one flaw in his whole argument. And I said to him, I said, "Well, what if the guy, this dead-beat person that can't get a loan but your client is co-signing, what if that guy doesn't pay? What happens to your client? Doesn't he lose money?" He said, "Well, then we just sell the house." I said, "Okay, but, what if the house goes down?" And he looked at me like I was from Mars. And he said, "This is Phoenix." He says, "Real-estate prices don't go down in Phoenix." And I imagine how many people lost a ton of money there, because that's probably one of the worst housing markets in the country. So Wall Street, everybody had this idea that housing prices couldn't go down. So nobody questioned these Triple A ratings. It didn't matter, because if somebody defaulted, you had the house to sell. But I knew that housing prices were going to fall. I remember when I would go on television and talk about housing prices falling and people would say, "Well, that's not going to happen, that hasn't happened since the Great Depression, that's impossible." But people would ignore everything that had happened in the last five years. They would see, here was housing prices, it was like this, and it went straight up. And they said, "Well, because they've never fallen, they can't fall." I said, "But they've never done this. How are they going to stay up here?" You know, they were saying it was like a permanent plateau. I said, "Look," I said, "There's no way." And, of course, everybody now, in hindsight, everybody wants to criticize the laxed lending standards, the lack of a down payment. Everybody knows all these things that we did that we did wrong — that we had too many people buying houses and credit was too cheap. So everybody can agree that we need to go back to a prudent form of lending. But nobody wants to go back to prudent pricing. Everybody wants to go back to sound lending principles but leave the bubble prices intact. That's impossible. It's impossible. How can we? Nobody can afford to pay these high home prices without these gimmicks. But the reality is, of course, the best thing that can happen to the real-estate market is that prices come down. It used to be that the mission of Freddie/Fannie, before they went broke, was to try to make homes, homeownership affordable. Now their mission is to keep home prices high, to keep homes unaffordable, to make sure we have to mortgage ourselves to the hilt to buy a house. The government solution is high prices but low mortgage payments subsidized by the government. The free-market solution is low prices. Because if real-estate prices go down, you don't need to borrow that much money to buy a house. So it doesn't matter that your mortgage payment is a little higher. But the government still looks at the problem that home prices are falling. That's the solution. The problem is that they went up. So, the problem, and the real problem that we have, of course, is now that the bubble has burst — first from the stock market, now the real-estate market — and now that we're having this massive recession, which is just getting started, we've barely gotten a taste of it. But, unfortunately, all the blame is on the free market. All the blame is on capitalism. It's because there wasn't enough regulation. There was too much greed. Right? And Alan Greenspan, or, not Alan Greenspan. President Bush, in one of his speeches, said that Wall Street got drunk. And he was right, they were drunk. So was Main Street. The whole country was drunk. But what he doesn't point out is, where'd they get the alcohol? Why were they drunk? Obviously, Greenspan poured the alcohol, the Fed got everybody drunk, and the government helped out with their moral hazards, and the tax codes, and all the incentives and disincentives they put in — all the various ways that they interfered with the free market and removed the necessary balances that would have existed, that would have kept all this from happening. We've always had greedy people. Everybody's been greedy, not just Wall Street. But all of a sudden everybody was greedy all at the same time? Can't they understand there's a trigger for this, there's a reason that everybody acted this way? Normally, when people are greedy, they're also fearful of loss, and people's fear of loss overcomes their greed and checks their behavior. But what the government did, repeatedly, was try to remove the fear — they tried to make speculating as riskless as possible. First, they provided us with almost costless money with which to speculate. And then they created the idea or the Greenspan Put. But whenever there's a problem, don't worry, the government is going to rescue you. The government's not going to let the stock market go down. The government's not going to let your bets go bad, so go ahead and keep placing them. That was the idea, that was the mentality. It was nothing that the free market did. In fact, the only entities that needed more regulations were the ones that the government created, Freddie and Fannie. I mean, if Freddie and Fannie didn't have a government guarantee, they wouldn't have needed any regulation because the market would have regulated them. People would have looked at their balance sheet and said, "Hey, you don't have any capital, you can't guarantee these mortgages, who are you kidding?" And they never could have expanded the way they did. It was only because the government stood behind them that people didn't care. People said, "Oh, the government will never let Fannie and Freddie go bankrupt." And they were right, they didn't. That was the question. We didn't know. When I wrote Crash Proof and I said they were going to go bankrupt, I didn't know the answer to that question. I said, we don't know: is the government going to let them fail or is the government going to stand behind them? And I knew the worst thing was that they stood behind them. It would have been much better had George Bush said, "You know what, we had no guarantee, we told you. In fact, on the prospectuses, when you bought the securities, on the front page it said, 'These securities are not guaranteed by the US government'." So the US government could have said, "We told you we didn't guarantee them and we don't." Now, a lot of people would have been pissed, a lot of people would have lost money, but it would have been better than what we did. Because we didn't make the losses go away, we just postponed them. We just put them on the backs of American taxpayers, or more realistically, holders of US dollars. But, where was I? See, I digress like that and I forget what I was talking about. But, what was I just on? Ah? No, no, no, no. No, I was talking about Freddie and Fannie. Yeah. So they knew that no one cared that their balance sheet was small, because the government guaranteed it. So, the one place that the government needed to regulate was Fannie and Freddie, and that's where they didn't regulate. In fact, every attempt to regulate them was thwarted by congress. Freddie and Fannie gave huge amounts of money to both Democrats and Republicans — anybody that tried to regulate them. But the reason they needed to be regulated was because they operated with a government guarantee. Once you gave them that guarantee, then the government had to regulate them and regulate them heavily, because it was government money they were dealing with — it wasn't their own money; it wasn't private money. Now, people can say, "Well, what about Wall Street? The subprime. There was a situation where there was no government guarantee." That's true. But Fannie and Freddie were the biggest buyers of subprime mortgages in the country. They were helping to legitimize the subprime market — they were big bidders in the subprime market. And, of course, it was Fannie and Freddie and FHA that really gave the impetus to the housing bubble — got it started, got the mentality there, is responsible for that way of thinking. So once the momentum was there, people just jumped along for the ride. And, of course, there were a lot of conflict of interests going on. Obviously, the rating agencies are in bed with the brokers. They're rating these bonds Triple A. They have to know that they can't possibly be that secure, but they're just like the real-estate appraisers. The rating agencies want jobs and they get jobs by coming out with good ratings — just like the appraisers. The appraisers just come and kept appraising houses high because they knew if they didn't appraise them high, they would never get another job. And, again, the whole reason — once you got to the securitization process, which is a natural occurrence — once you got securitization, once you separate the originator of the mortgage from the risk of the mortgage, you got the moral hazard. The guy that's getting the mortgage done, the mortgage broker, he couldn't care less whether that loan is ever going to get repaid. He just wants to originate it. And since he's the one that hires the appraiser, he just wants to hire an appraiser who will appraise the house high enough to fund the mortgage. That's all he cared about. So there were a lot of these moral hazards, but a lot of them got started because of government. And they never would have been able to grow to the extent that they did if it wasn't for government. And, of course, one of the very reasons that so many financial institutions are in trouble, so many of the major banks in this country — and, of course, all of our major banks would already be insolvent, they would already be broke if they hadn't got money from the government, and if the Fed hadn't been buying up all the assets. Well, one of the reasons that no one cared is because of the FDIC insurance program. Nobody in this country cares at all what the banks do with our money once we put it there. Because it's all insured by the government. No one cares. It doesn't matter. People do a lot of research before they buy a plasma TV, but nobody does any research before they put their money in the bank. No one cares. Who could care? Because the government has created a moral hazard by guaranteeing the accounts. If the government didn't guarantee bank accounts, then banks would not be doing foolish things with our deposits. Because people would care, because people could know, gee, if you make loans and they don't get paid back, I'm going to lose my money. "People do a lot of research before they buy a plasma TV, but nobody does any research before they put their money in the bank." So banks would not just compete on how much interest they'd pay, but they would compete on how safe their balance sheets are. And there would be a lot of people looking out for them, because, probably, individual consumers, before they made a deposit, would want to look for some type of equivalent of a consumers' report, where somebody rates banks and follows banks and says, "Here's the safe banks." Nobody bothers to do that now. Why? Because no one is any riskier than anybody else, because they're all guaranteed by the government. It doesn't matter. But it creates a huge moral hazard when you do that. The same thing, look what Bernie Madoff was able to pull off. Do you think he could have done that without the SEC giving him a stamp of approval. Or without FINRA? There's no way that if we didn't have regulators the private sector wouldn't have ferreted this guy out. There would have been a lot more due diligence if everybody didn't think the government was doing it for us. And, of course, I said, instead of putting Bernie Madoff in jail, we should just make him Secretary of the Treasury. Because he's got a lot of experience, exactly the kind that we need, running a Ponzi scheme. Because the Chinese just mentioned yesterday that they were getting a little concerned about all the money they loaned us and that just maybe we won't pay them back. I'm sure they're a lot more than just a little concerned, because that's what they said publicly. Imagine what they're saying privately. Because they know we're not going to pay them back. Of course we're not going to pay the Chinese back their money. It's impossible. We can't. We can't possibly. Can you imagine? Can you imagine if President Obama, giving the following type of speech to the American citizens. He'll give a national televised address and say, "My fellow Americans, I've got a little news for you today. We're going to have to have a massive, across-the-board tax increase on average working Americans. Any American that still has a job is going to have to pay much higher income taxes. "And, as a matter of fact, we're going to have to cut Social Security across the board. Forget the Social Security check, we're going to have to reduce it. And remember all my plans about more education and health care for everybody and energy independence, we got to put all those plans on hold, because the Chinese need their money. "We borrowed a lot of money from the Chinese and we're good for our debts. They worked hard for that money and they loaned it us to and we're going to pay it back. And that's going to require a big sacrifice on our part." Does anyone think that we're going to do that? What are they, kidding me? Do you know what we're going to tell the Chinese? We're going to say, "You guys are predators, predator lenders. We need a modification program. We need a cramdown on this. You never should have lent us all this money. You know we can't pay it back. It's not our fault." The Chinese know this. The Chinese, they can't even vote in our elections. Why are we going to care what they think? We're going to tax voters to pay non-voters? So the Chinese know they're in this box. The US government, we don't pay our bills. We're like Bernie Madoff. People loan us money. How do we pay it back? We borrow more. If somebody came to Bernie Madoff a couple years ago and wanted their money, they got it. Why did they get it? Because they were able to take in new money. They found another sucker who didn't know it was a Ponzi scheme. Same thing the US government does. Every time a bond matures, we just go sell another one. And every time we need to pay interest on the national debt, we go borrow that too. Well, it works until nobody wants to lend us any more money, then we're going to have to default, just like Bernie did. And there's only two ways we can default. We just legitimately don't pay, or we print money. That's it. There's only two ways to repudiate your debt. There's no way we're going to pay the debt; the Chinese have to know that, and we're going to figure that out. But, anyway, let me get back — I keep going off on too many tangents. All right. So the free market, that's where I was. The free market was getting the blame for a problem that was created by the government. And, what's happening now, of course, is the government is using this economic crisis, that they caused, to get even bigger, to grow their power, to expand, to come to our rescue, to save us from the evil forces of capitalism with government, with socialism. And when you listen to Barack Obama — I listened to his most recent speech, and a lot of what he said was true. He talked about the fact that we need a genuine economy, we can't have a false prosperity, we can't have a prosperity based on debt and spending, we need to have a sound foundation. All that was true, but then, of course, everything else he said was wrong. He wants the US economy to have a sound foundation, but he wants to be the one that builds it. He thinks the government can erect a sound foundation; that central government planning can replace the market; that resources can be allocated efficiently by politicians who want to get votes, as opposed to entrepreneurs who are looking for profits. He wants to replace the invisible hand with the hand of the state. And he thinks that he can do it better. The problem is, sure, we had a phony economy, that's true. We had a phony economy because of the government. Because the government undermined our productive capacity, undermined our ability to save, undermined our ability to manufacture, and nurtured and cultivated the consumer bubble that, this service sector economy that we had, that's now collapsed. And it's not government that's going to restore it. We need free-market forces. The government right now — everything that they're doing — what is the government trying to do right now? They want to bail people out and they want to stimulate. Well, the bailouts are the worst thing that you can do, because they want to bail out companies that should fail, that should be bankrupted. Bankruptcy is a good thing. It's the way the market cleanses the economy of companies that shouldn't be there. Why shouldn't they be there? Because they're not generating profits; they are not effectively utilizing resources. Those resources need to be freed up. Right now they're being held hostage. We need to free them up so that we can use them productively. They say, "Oh, we can't let General Motors go bankrupt because some autoworkers will be unemployed." Well, we don't want work just so we can have a job. We want work because we can produce something. We want the value. If somehow we can all have like a little machine that we could just push little buttons and whatever we wanted would magically appear, right, nobody would have to work. And the government, of course, would try to outlaw those gadgets, because it would create a lot of unemployment. But who would care? We wouldn't need employment, we would have everything we want. "Bankruptcy is a good thing. It's the way the market cleanses the economy of companies that shouldn't be there." So, we work because we want stuff, not because we want to work. So just to preserve jobs doesn't make any sense if they're not productive, if they're not efficient. Now, I can understand why some of the autoworkers would want to preserve their jobs if they're being overpaid. I can certainly understand why a lot of these executives want to preserve their jobs. But society doesn't want to do it. The government shouldn't be doing it. We need to let companies go bankrupt. And when I talk about letting General Motors go bankrupt — and I, of course, I was predicting that they would go bankrupt five or six years ago. I knew they couldn't survive. But, if we let them go bankrupt, does that mean it's an end to the automobile industry? Does that mean that all those plants in Detroit or in the Detroit area are just going to sit idle? That all those skilled workers are just going to sit there and nobody is going to try to hire them? Of course not. What would happen if we let General Motors go bankrupt is that some entrepreneurs would step up and buy up the assets at a bankruptcy, and they would no longer be encumbered with big labor union contracts or health care obligations or interest on debt. They would be able to buy the assets without the liabilities and organize them in such a way to make cars profitably. Now, in order to do that, they would probably have to pay their workers a lot less than the workers are being paid now, but at least they'd be working for companies that made cars profitably. And we'd probably end up with a lot more people working in the automobile industry than we have today. And, the fact of the matter is, rather than making cars for Americans, we should be making cars to export, because Americans, we don't really need any cars. We have too many cars. We have, what, two or three cars per household at this point. When the president makes a speech and he says, "We need to restore credit," he keeps saying, "Credit is the life blood of the economy; we need credit so Americans can go out and buy more cars." You can look at the United States and say, what's wrong with our economy? We don't have enough cars. We need more cars. That's the last thing we need. Now, we need to make cars. You know why we need to make cars, because there are a lot of people in China that are still on bicycles. They need cars. We should be able to make cars for them and export them. We don't need them for ourselves, because we own too many cars. We have too much everything. Have you ever seen some of these commercials — or not commercials, these television... the news stories, where, when they foreclose on houses, they send these companies in and they got to clean the places out and get them ready. And it's amazing to me, but they would go to these houses that people abandon and they're full of stuff. The TV sets are there, the stereos are there, there's clothes in the closets. Why didn't these people take this stuff? They didn't even want it. We got all this stuff and it doesn't even matter. They didn't even care about it. And all this stuff, of course, was bought with borrowed money. We didn't make any of it, we didn't have any money to pay for any of it. The last thing Americans need is to buy more stuff. But the government, part of their economic stimulus in addition to the bailouts — and of course they want to bailout Wall Street investment banks. Why? Let them fail. What do we need them for? Why do we need Goldman Sachs? Why do we need Morgan Stanley? Let them fail. "The last thing Americans need is to buy more stuff." The government tries to blame all the economic problems that we have today on the fact that they let Lehman Brothers go out of business. Meanwhile they bailed out everybody else and we're in this gigantic mess. Maybe it's not because they let Lehman fail, maybe it's because the other bailouts. But, no. Now they want to make us believe that since Lehman Brothers failed, they can't let anybody fail. We don't need all these investment banks. And if they go away, it's not going to mean that brokerage is going to stop, that investment banking is going to stop. It's just going to be done by somebody else. There are a lot of small firms out there like mine that are expanding, that will expand even more if the government gets out of the way. But instead, the government is rewarding the incompetent people and keeping them in business and they're punishing all the competent people. Meanwhile, look at the bonuses, look at the amount of money that is being paid to Wall Street executives using bailout money. How can these guys be entitled to make multi-million-dollar-a-year salaries when their companies are losing a fortune based on what they're doing? Let them fail. Let them go out of business. But the stimulus, what is it that the government is trying to do with the stimulus? The government is trying to recreate the conditions that led to the crisis. Because when they talk about stimulating the economy, they're not talking about stimulating economic growth. They're talking about stimulating spending. They want us going back to the auto showrooms, back to the malls, and buying more stuff. And they want us going deeper into debt to pay for it. And if we're not willing to accumulate the debt on our own, well, then the government will do it for us. As if this is a secret. If they could just spend enough money, then the economy's just going to magically grow again. And that's all nonsense. The only reason it worked before — and it really didn't work — was because we were able to borrow the money from the rest of the world and spend it. And we were able to live in the delusion that we were getting richer even as we were getting poorer. Because we looked at our asset prices. We were looking at real estate and stock prices going up, and we said, "Hey, we're actually getting wealthier!" — even as we were getting poorer, because we were spending money instead of saving money. But — and as we spent money, we counted that spending as GDP. And, so, as long as our GDP was rising, we thought our economy was growing. But the whole time our GDP was actually going up, we weren't measuring real economic growth. We weren't measuring how much wealth we had been destroying or dissipating. We were simply spending. And we thought we were okay because some appraiser said that our house was worth more, or the stock market was still going up. But all that was an illusion, and now that those bubbles have burst, there's no way to go back to it. Stock prices — I don't care, you're going to have ups and down, but stocks in the United States are still expensive. Based on any kind of historic measure of value, the PEs are high and the yields are low. Stocks are overpriced. Houses are overpriced. Our assets are still overpriced, despite the fact that they've fallen. Meanwhile, our whole economy is phony. The malinvestments that we have now is this entire service-sector economy. We built an economy based on the idea that we can borrow and spend money in perpetuity, and that was just as phony as the idea that real-estate prices would always rise. So we have a lot of Americans that are working in jobs that they really shouldn't be in. We got a lot of Americans that work in retail, that work in shopping centers, that work in restaurants, that work in financial services. There are a whole host of Americans employed doing things that they really shouldn't do, because, you know what, we're too broke to patronize their businesses. We need more Americans making stuff, producing things. And, of course, in order to get a job in goods production, we need capital. You can't produce anything without machines, without tools. Where's that stuff going to come from? You can't just wave a wand. You're going to have to have savings. Somebody's going to have to be able to borrow the money to make those investments, which means Americans are going to have to save their money. Or we're going to have to convince somebody in another country to take their savings and invest it in America, not just lend it to us. I had a debate on CNBC one time with Art Laffer. And, it's about a ten-minute debate, the clip is on YouTube. And part of it, where he bet me that penny, went into that Peter Schiff video. But in that whole debate, when I tried to point out that we were borrowing too much money, Art Laffer said that, that my nervousness about all the debt was wrong. And he said historically America borrowed a lot of money in the 1800s, and it was not a problem; we ran huge current account or deficits, or we borrowed a lot of money and the economy was in great shape. So, therefore, my criticism of our debt was wrong. Well, what Art didn't understand or didn't appreciate was the difference between what we did with the money. Back then, we borrowed money to make investments, to build infrastructure, to build factories, to build farms, to build a productive economy. We invested the money; we didn't just spend it on stuff. And when you borrow money and you invest in productive capacity, you have a real asset and the asset can generate revenue. If we built a factory that manufactured widgets, we could sell the widgets to the British and to the French, and earn enough money to pay back the money they loaned us — and the interest. And we became the world's wealthiest economy because we borrowed to produce. What we've done recently is we've borrowed to consume. We didn't produce anything. We borrowed money and bought trinkets. We bought depreciating consumer goods. So how can we possibly pay the money back? We didn't acquire any income-producing assets to pay the money back. "We borrowed money and bought trinkets." So, if we're going to rebuild a viable economy, and if we don't have our own savings, we're going to have to convince the Chinese and the Japanese to build factories here. Well, why would they want to do that? With the high regulations that we have right now, with the high taxes that we have right now, we're just not competitive. So, the only way that we're ever going to rebuild a sound economy in the United States is, number one, we're going to have to stop all the stimulus and stop the bailouts and let the free market work. We have to understand that what's happening right now is not the problem, it's the solution. The problem was the bubble blowing up, not the deflation. We have to allow the pain, no matter how unpleasant it is. We have to understand that anything we do to delay this is going to make it worse. When you have President Obama talking about how everything is different than George Bush, how his administration is change — we're doing it differently. He hasn't changed anything. He's doing exactly what Bush did. He inherited the same situation, only worse, and he's doing the same thing, only worse. His fiscal policy is worse than Bush's. And it's funny; as he's getting ready to sign a budget, or proposing a budget, with near a two trillion-dollar deficit — in one year — he's criticizing Bush for deficit spending. And what Bernanke is doing? The things that Bernanke is doing now dwarf what Greenspan did in irresponsibility. I still say that it's a tough race. I said that there's a race to see who's going to go down in history as the worst Fed chairman ever. And Greenspan is probably still in the lead, but Bernanke is hot on his tail. And the only reason that Greenspan is still winning is because he was there longer. But as far as for how many years he's been at the helm, it's going to have to go to Bernanke. But, so the combination of Obama/Bernanke is way worse than Bush/Greenspan, but it's the same philosophy. Nothing has changed. This might as well be the third Bush term. He is doing the same exact stuff. The rhetoric is a little bit different, but the policies are all the same, the ideas are all the same: that economic growth is a function of people spending money and that we need more government to stimulate the economy; that we should bail out the people who fail and punish the people who succeed. And that we should have no interest rate. The Fed should be cranking out money. What we need — not only do we need to allow the companies to fail and allow Americans to stop spending. The credit crunch is a good thing. The fact that credit is being denied to American consumers is a good thing, because credit is scarce, it's not unlimited. It's a function of savings. And if we want to have a real economy, if we want to have production, then savings need to go to producers. Well, they're not going to go to producers if they're squandered by consumers. They're not going to go to producers if the government is borrowing all the money. So what do we need? We need the government to eliminate the deficit and go to a surplus. We need the government to stop spending money and depleting our savings. We need consumers to stop spending money and rebuild their savings. We need a recession. We need it. We need one badly. And what the government has to do is fess up and let us know, yes, this is the price we pay for years of indulgence and reckless spending; now comes the sacrifice, now comes the penance, we're going to have to take this recession. And there's nothing the government can do about it. The only thing the government can do about it is to acknowledge to the American public that the government is a burden on the economy. And in good times, maybe we can tolerate that burden, but in bad times, there's no way. "The only thing the government can do about it is to acknowledge to the American public that the government is a burden on the economy." And that the only way we're going to rebuild this economy is with a smaller government, not with a bigger government. And we need sound money. Unfortunately, we need high interest rates. We're getting the opposite. Instead of getting higher interest rates and smaller government, we're getting lower interest rates and bigger government. We're getting inflation and we're getting deficit spending and we're getting stimulus, and we're not going to have any different results this time around. So, if you liked what Bush/Greenspan did to the economy, then you'll love what this pair does. But it's not going to be any better. It's going to be a bigger disaster. What is the crisis that they're setting up? Because we are right now suffering the consequences of the economic stimulus and the bailouts of 2001 and 2002 and 2003. If we would have had a more severe recession, we would not be in this mess today. So, the question is, what are going to be the consequences of what we're doing now? And what I think is going to happen is that, ultimately, people like the Chinese and the rest of the world — the Saudis and the Japanese and everybody else — they're going to figure this out, and they're not going to want to play this game any more. We've got them conned right now. In my book, in Crash Proof, I compared it to Tom Sawyer. You know, there was that passage in Tom Sawyer where Tom gets everybody, all the kids in the neighborhood, to whitewash his fence. And he gets them to pay for the privilege of doing his chores. And when Mark Twain wrote that passage, he probably had no idea that it would one day form the basis for the entire global economy. But we've got the world painting our fences. Like they don't have their own fences that need painting. But the world is not going to accept this, this economy. You had Hillary Clinton from when she went over to China, a couple weeks ago, to get them, to beg them to buy our bonds. She'd tell them, "We're all in this together." And basically this is what she tells the Chinese: "You need to take money away from your citizens and loan it to us, so we can give it to our citizens so they can use it to buy products made in your company to keep your people employed." That's the deal that we're making with them. Now, what the Chinese should say to Clinton is, "You know what, I got a better idea. Why don't we just leave our money with our own people and then they can use the money to buy their own products. That way we get to keep our stuff." The way it is now, we get all the stuff and all they get is the jobs. Well, what good are jobs without stuff? That's slavery. So they're going to figure it out. And what's going to happen is they're not going to buy our bonds, and the Fed's going to start buying all the bonds, and the dollar's going to plunge. And this crisis is going to end up being a currency crisis. And when it becomes a currency crisis, then you're going to have higher consumer prices and you're going to have higher interest rates. Right now, we're creating a lot of inflation. A lot of people are talking about, "Oh, there's not inflation, it's deflation." That's all nonsense. Real-estate prices are falling because they're too high. Stock prices are falling. But that's not deflation. That's just falling prices. There is no contraction of the money supply, it's growing like crazy. "And this crisis is going to end up being a currency crisis." But the expansion of the money supply is not immediately showing up in rising prices for commodities or consumer goods, because there are other temporary factors that are pushing prices down at the same time inflation is pushing prices up. You've got deleveraging; you've got bankruptcies, going-out-of-business sales; you've got a lot of companies liquidating their inventory; and you have the dollar strong. And what happened was, paradoxically, when this crisis began, money flowed into America instead of fleeing America, which it will do ultimately. Can you imagine there's a giant explosion and everybody's running towards the blast? That's what's going on. And when people look around the world and they say, "Well, people are coming to America because as bad as it is every place else, it's so much worse here." That's nonsense. That's just what they're saying to explain it. Just like they tried to justify the real-estate bubble or the Internet bubble. That's all nonsense. The reason it's so bad in the rest of the world is because they loaned us so much money and we can't pay them back, and now they're losing, based on their bad loans. And what's really causing the global credit crunch is that we're borrowing so much money right now, we're crowding out everybody else. The fact that people are loaning us so much money means that private businesses around the world can't get capital. Why? Because it's all going to the US government, that's why. So the world is suffering, not because our economy is collapsing, but because they're foolishly trying to prop it up. And when they figure this out, then we're going to get a real economic crisis. Because when the dollar starts to plunge — and it will — then we're going to see prices rising, sharply, for consumer goods, and interest rates rising. And if we think we have problems now, wait till we see how much worse they get when we throw rising consumer prices and rising interest rates into the mix. And there's nothing the government's going to be able to do about it. Right now, unemployed people are getting the benefit of lower prices. Imagine when you're out of work and your prices are going up, because that's what's going to happen. And then this is going to be a real economic crisis and then we're going to be in for very, very difficult choices. And, unfortunately, the worst-case scenario is one that is looking increasingly more likely, which is hyperinflation. And if we get that, that's where nobody will lend us money. And, so, the Fed buys all the bonds in order to keep interest rates down and to maintain deficit spending. And, then, the velocity money really starts to pick up. Nobody is going to want our money — not even American citizens will want our money and they will try to spend it as quickly as they can. The government might try to keep it together a little bit longer, with regulation. Maybe we'll have capital controls. Maybe they'll make it illegal for American citizens to do what I'm doing with my clients right now — buying foreign currencies, foreign stocks. Maybe they'll make it illegal to buy gold. As prices really start to contract, to escalate, private parties will try to make contracts with payment in gold or other currencies. Maybe the government will make that illegal. There might be stores or people that actually don't want to accept dollars because their value is dropping too rapidly. The government will make that illegal. And that means that we'll have a black market. That means if you want to buy something, you'll have to buy it on the black market, just like they did in the Soviet Union. The only reason you could buy anything there was because you bought it illegally. A lot of these things are going to happen. I think early on, probably even in Barack Obama's first term of office, I think we're going to have price controls. I think prices will be rising so rapidly, maybe even by next year, that they're going to impose price controls on a number of products; probably energy, probably gasoline, probably milk, bread. And we're repeating all the mistakes of the 1930s. We might as well repeat the mistakes of the 1970s. And, so, when they put on price controls, what's that going to mean? Shortages, power blackouts, long lines for gas, long lines for food. A lot of things are going to happen, I just mention that. Everybody now, of course, is talking about the 1930s and saying, "Oh, no, we can't repeat the mistakes of the '30s." Well, that's exactly what we're doing. "And we're repeating all the mistakes of the 1930s. We might as well repeat the mistakes of the 1970s." The popular notion is that we had a depression because Hoover was so irresponsible that he trusted the free market and he did nothing, and because he did nothing we had a depression. And then Roosevelt rode to the rescue and saved the day with big government. Well, the reality, of course, is that we had a depression because, (a) we had a Federal Reserve that was too easy in the 1920s and created a boom. And then when the boom bust, Hoover ignored the good advice of his secretary to the treasury — which maybe is the last time the secretary to the treasury ever gave anybody any good advice. And instead of allowing the free market to work, he came up with all kinds of crazy things to bail people out and to prop things up and to distort prices and fix wages and all kinds of things that created the depression. And then Roosevelt came in and proceeded to make it worse. 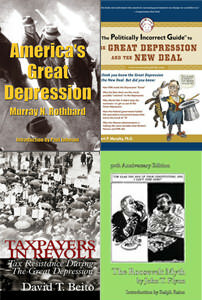 And everything that Roosevelt did exacerbated it and made the depression great. And we eventually got out of it after the Second World War. But how can anybody say that we got out of it because of Roosevelt? We got out of it despite Roosevelt. We would have got out of it a lot faster had Roosevelt not just expanded the failed policies of Hoover. And that's very similar to what's happening now. You got Bush, who is the Hoover now of this generation, who is now associated with the free market, who is nothing like the free market. And now we have Barack Obama, like Roosevelt, coming in to save the economy with big government. Of course, the government is already huge. Maybe he hasn't figured that out. When Hoover left office, I think the federal budget was about four billion dollars. That was the whole thing. And Roosevelt doubled it to about eight billion. Now we're at three trillion. Three trillion. That means the government is huge. And, of course, when Roosevelt came in, we had a sound economy, beneath the surface. We had a productive economy, we saved, we made stuff, we exported. We didn't have a huge social-welfare state — nobody got checks from the government — we were in much better shape. If they did that much damage to a sound economy, imagine what they could do with the one we got now. Plus, back then, we had real money. We were on the gold standard. Now look at us. Look at the problems we had in the 1970s. Still, we had a fundamentally sound economy then. We had a bubble in the '60s. Same thing, the same stock-market bubble. We printed too much money, we went to Vietnam. We fought the war in Vietnam, we went to the moon, we had the war on poverty. The government created too much money and they gave us the 1970s. That was the payback for the 1960s. But when Reagan came in and when Volcker came in, we actually got some sensible policies. We shrank government and we raised interest rates; we went for sound money and smaller government. When Reagan came in it was, "The government is the problem." Now, Barack Obama is, "The government's the solution." It's night and day. And there's a lot of other people that say we can't repeat the mistakes of Japan. Well, again, we're doing exactly what Japan did. Japan had a bubble in the 1980s. Why'd they have a bubble? Same reason we had a bubble. They kept their interest rates too low. Why did they do that? To keep the yen artificially low, because they didn't want the dollar to collapse. Kind of like what we did with Great Britain in the 1920s. Very similar. So the Japanese kept interest rates too low, and they're still too low. But they kept them too low and they had a bubble. Two bubbles: stocks and real estate. Pretty familiar. Stock-market bubble burst first; real-estate bubble, two or three years later. And, of course, real-estate prices are still falling in Japan — what is it, 15, 20 years later? They've fallen 70 or 80 percent. And that's in a country where you lose face if you don't pay your debts. And they have high savings. But the problem in Japan was the government in Japan refused to allow the market to function — didn't want to take the pain of the deleveraging and the unwinding of the bubble, so they intervened and intervened and intervened, and ran up the deficits and postponed this thing and dragged it out. But the main difference between Japan and America is Japan was a wealthy nation that could afford all that big government. They would have been better off without it, but the Japanese economy, beneath the surface, was so competitive and so fundamentally sound that they survived anyway. They had enough domestic savings to fund the growth of government. The Japanese didn't borrow any money from anybody else — nobody would lend it to them. The Japanese citizens financed that gigantic government, but they still have a high savings rate. They're still the world's biggest current-account nation. They're the world's largest creditor nation — even still bigger than China. So, they were a wealthy country. Yet the Japanese government managed to create so much damage to an economy that was fundamentally sound. We're the exact opposite. There's no way that we can get off as easy as Japan, because we're a mess. We're the world's biggest debtor. We have a huge trade deficit, we have no domestic savings, and we're already loaded up with debt. And the only hope we have of artificially stimulating our economy is that we borrow the money from the rest of the world. We don't have it on our own. So, when the world stops financing this, it's going to come to an end and we're going to have to make these hard choices. Is it going to be hyperinflation or are we going to do the right thing? But the rest of the world —and a lot of people think this, I've had a lot of arguments, people call it decoupling: "Well, this is never going to happen," or, "When America stops consuming, the whole world is finished." "Is it going to be hyperinflation or are we going to do the right thing?" They're not finished. We're not the engine of the world's economy, we're the caboose. And if you decouple the caboose, the cars move faster. We're not doing the world any favors consuming their stuff. It's just vendor financing. But people say we're the best customer. We're not; we're the worst customer, because we don't pay. A good customer pays you. And in the world of trade, you pay for imports with exports. And if you don't have anything to export, you can't pay, and that's what we have. We issue an IOU. And when the world finally lets the dollar collapse — and they will — our purchasing power isn't going to vanish, it's just going to be redistributed. Other currencies are going to rise. And people in other countries, people that are working in factories right now in China, that are producing products and just shipping them abroad and just kind of waving good-bye, all of a sudden, they'll be able to afford them. The Chinese will be able to turn in their bicycles and buy automobiles because steel will be cheaper, because cars will be cheaper, because the value of their wages will rise because their currency will gain purchasing power. It's the Americans who are going to be buying the bicycles. Because, all of a sudden, cars will be too expensive for us, gasoline will be too expensive for us, because we'll be bidding with currency of much less value. And that's what's going to happen. And the world is not going to suffer because we don't buy their stuff. They're going to benefit because now there's going to be more stuff for them. Right now, because the world lends us so much money, there's a capital shortage. Wouldn't the world be better off investing their savings productively in their own countries, rather than just giving their savings to us? Wouldn't they be better off enjoying the fruits of their own labor, rather than laboring while we enjoy the fruits? It's obvious. And it's going to happen. Henry Hazlitt Memorial Lecture, Austrian Scholars Conference, March 13, 2009. An MP3 audio version of this lecture is available for download. You can also watch the video. Transcript provided by Jennifer Lewis.